My In-Laws celebrated their 60th wedding anniversary this month, and I wanted to make a special card for them. The symbol for 60 years is Diamond, so that was my focus. I have no gem type stamps, so I looked for drawings of diamonds and found one that with the aid of a ruler I felt I could copy fairly well. After drawing it lightly with pencil, I colored it with colored pencils in shades of dark grey, light grey and silver. I added strokes of Spectrum Noir sparkle pen to different areas of the gem. I added the 60 die cut with Avery Elle Count On it Dies cut from DCVW glitter paper. The sentiment comes from Hero Arts. Underneath at each of the top sides and the bottom point of the gem, there are Chibi lights in white. I had a few hic ups along the way, primarily not realizing how bright those lights were and how much shadow they could create under the panel outlining every crooked piece of foam tape I had laid down. I tripled my front panel by cutting more with the WPlus9 Sunshine layers die and that helped tremendously with the shadows. As ever, thanks for stopping by! A quick post of a birthday card for a crafty friend who likes purple! The image stamp is from Inky Antics. Sentiment from Hero Arts. Scallop die WPlus9. Sequins Pretty Pink Posh. Hi There! My good friend Greta, sent me some die cuts last year. I have been saving them, and I put them on a few cards. The die cuts were on white paper. I heat embossed them with silver for my cards. The sentiment comes from a CTMH set. Hands down, this is my favorite purchase for this holiday season. I so love this set. I love decorated sugar cookies, or cut out cookies as some call them. I have made them for the holidays since I was old enough to bake without supervision. I still make them, but only once a year. When we visit hubs family in Ohio during the holidays, I can almost always count on some iced cookies appearing on the counter at some point. They are so good, and always remind me of the holidays, family and good times. So when I saw this set at PTI, I had to have them. It was love at first sight. There are so many layers to the set, I bought the dies and the stamps. I confess to using the stamps only for the outlines on the cookies and for the sentiments. The remainder of the cookies are decorated and layered with die cuts. They have HEFT, they have dimension. They have many many many pieces. I will only be making these for family because they are time consuming. Though I hope to get a jump start on next year :-)! Don't they look good enough to almost eat? I fell in love with this set from Stampin Up - Christmas Magic. Here are two cards stamped on watercolor paper and colored with distress markers. For the first one, I definitely went with all the lines, and added some trees to the background. The panel is foam mounted over a bit of glitter tape. For the second one, I tried more of a no-line coloring style. Here are a few more Christmas cards. These images are digi files from Power Poppy. 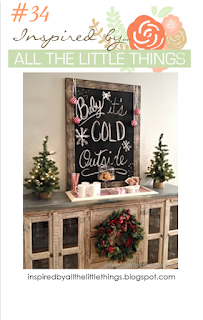 I first saw the wreath images over at 'my little stamping blog', and I was quite taken with them. I brought them along with me to California for some quick cards. The images were a joy to color. If this is laid out in a wonky fashion...my apologies. I am using my IPad while traveling. Thanks so much for stopping by. Merry Christmas. Hi a quick post while I am still traveling. This card is for my fabulous MIL. She loves pink and I hope she loves this card too. The flower image is actually a piece of fussy cut fabric mounted on sticker paper to stop the edges from fraying. The oval is a spellbinders die cut that was embellished with crochet stitches. I added the sentiment with a vellum strip heat embossed in white. All was mounted on a coordinating pink card base. I am on my way to California to visit my Dad for the holiday's. I have kept back a few cards to post while I am gone. First up a birthday card for a friend that loves penguins. I usually send her flowery cards, so this year its a change up. When I got this PTI Splits Tis the Season stamp and pulled it out to play with it, I wasn't sure what to do with it. I was lamenting the fact that I had not bought the matching die. So after stamping, embossing and coloring a few pieces of watercolor paper they sat, and sat, and sat. Finally, after about a week I decided they needed to be finished, and it must have been the right time. I love how they turned out. I embossed a panel, first diecut with a wonky stitches die, with a Sizzix embossing folder. 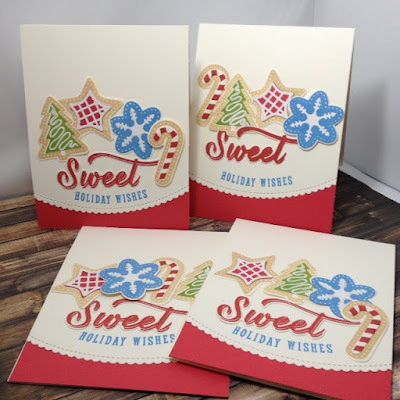 My stamped and colored image was die cut with MFT's stitched Arch die. I added a bit of glitter or foil tape as well. Every once in a while a stamp set comes along that I cannot stop playing with. Usually for me it is a floral stamp set, I love flowers. So imagine my surprise to find myself absolutely in love with Simon Says Stamp's Merry and Bright designed by Kristina Werner. They were deigned for the December card kit. I was happy to see that I could buy just the stamp set at the same time the kit was released. I love the images, and I could color them all day long and all week long. I have been coloring them alot and this is hands down my favorite stamp this season, maybe even this year! I am submitting these two to Simons Flicker Challenge Make it a Happy Holiday. After coloring the images and matting them, I decided they needed a bit more sparkle...so I dug out the stickles. I'd forgotten how much fun they can be! Sympathy cards-- I really don't like making them. Usually it is because I need one. The Father of a friend of ours passed away recently and I needed a card. I think this will be my go to sympathy card in the future. 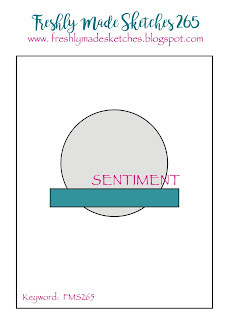 Do you have a go to style, stamp or design for a sympathy card? Do you keep some around, or do you make them as needed? Hi There I took a wee break from the Christmas cards...still have several to make. I let hubs go through my bin and pick out the ones he wanted send out...and somehow his list got bigger and my stash got smaller! So I still have more than a dozen to make. 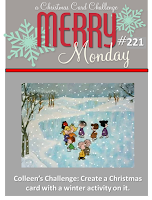 The Penny Black Saturday Challenge for December is Winter or Christmas Card. I was looking at a wintery/holiday stamp set from Penny Black called Seasons Wishes. There are several Christmas sentiments and also the wintery one I am using tonight. This card will be mailed to hubs while I am in California with my Dad for Christmas and he is with his folks. This card took a bit of effort. The bird and branch stamps were both colored with markers and stamped several times onto a card panel. (The misti is so useful for this technique.) Then they were stamped with versamark and clear heat embossed. The sentiment was stamped with onyx black in and clear heat embossed as well. Once the embossing was cooled, I loaded a Clarity brush with some Hero Arts Cornflower ink and I added the blue to the card. I wanted a hint of sky without coloring the entire card panel. Lastly, I die cut the panel with a wonky stitched rectangular die. I think hubs will love the card! I saw the sketch at Freshly Made Sketches#265 and I took a bit of a liberty with it, but I am going to submit it anyway. I love MFT's Stitched Arches Stack. It's such a unique shape. And, if you ignore the bit of the circle below the banner in this week's sketch...its a perfect fit! The scalloped and stitched die is from WPlus9's Sunshine Layers, the sentiment from Penny Black, the Church is from Simon's, and the blue card and the star is from Stampin Up. The embossing powder is Hero Arts Silver. Thanks for stopping by! Enjoy your weekend. 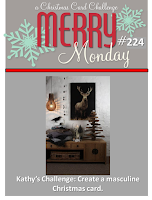 This week Merry Monday is looking for a Masculine card. CAS on sunday is looking for a Christmas card. Addicted to Stamps and More is Make your Mark this week. And anything goes at Simons Wednesday Challenge. ETA: Also adding all three to Simon's Flickr challenge 59 - Make it a Happy Holiday. The last several cards I have made are all copic colored. These are my favorite cards to make, and they fit several challenges. First up this sweet lil reindeer for Merry Monday. I fell in love with him and he looks great on that brown card base. I know the scallops are a little girly, but the color scheme and the lack of glitz put this on the masculine side of the column. For CAS on Sunday, this card using the same stamp set, but a different image and sentiment set. For addicted to Stamps this card fits, it is one of the first images I colored late last year and I actually liked my coloring. I've been coloring so much more this year and I had to bring that stamp out again and color it up. Its such a darling group of cuddle bugs! And they are all going to the Wednesday Challenge at Simon Says Stamp. Hi There! I have two more days to get lots of cards made; but I also want to play a couple of challenges. Muse Christmas Visions 72 has Cornelia Wonekor as our muse and she gave us a two layer tag with vellum, some gorgeous blues and silver accents. The photo is at the end of my post. Since I need cards, I made a card version using her color combo, some vellum and silver embossing powder. Hero Arts: F5625 Ornament with matching Die, Silver Embossing Powder; Simon Says Stamp - Falling snow stencil, Big Scripty Greetings Holiday. Last night hubs and I grabbed a Christmas music cd, and drove to take in a light display near Annapolis. I don't know what it is, but the lights just make me giddy and happy like a kid. That reminded me of this sentiment stamp after I saw the challenge over at Inspired by All the Little Things #34. I added a bit of color to the white embossed sentiment using Prismacolor pencils in white for a base and then green and red. A frame was cut to put everything to a better proportion. The stamp is from Stampin Up. The graphic is below. The framed blackboard caught my eye along with the red and green bits. Here are a few pictures from our drive last night. These designs are many many many feet tall and wide. Some of the designs were animated. I enjoyed it tremendously. Tonight hubs and I are doing a bit of decorating, not a whole lot since the holidays include travels for both of us. In the rush of preparations and other unexpected happenings, I forgot to post the last of my Thanksgiving cards. Since it is still November and giving thanks is something we should do frequently, here it is! I fell in love with those little CTMH squirrels the moment I saw them. The die cut panel is from SSS, the leaf die is Lawn Fawn. 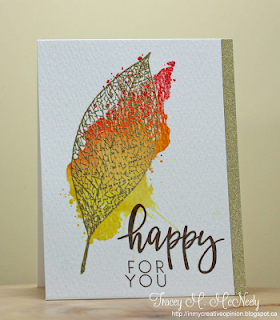 Hi there, a few days ago I was reading blogs, and I fell in love with a few of the designs from Therese at Lost in Paper. She made six cards from one stamp set with several designs. What really caught my attention was the partial cut of the image against a patterned paper backdrop. This isn't the first time I have seen this technique. Her images were so adorable. The card design was fabulous and stayed with me for days, so that this time I was inspired to try out the technique for myself. Muse Christmas Visions is joining up with Tracey McNeely's 25 Days of Christmas Tags this week, and we are to make a tag with vellum. One of the tags on the MuseCV post, had two layers of tags, one of vellum and both mounted on a small flat bag with some stripes on it. I was inspired by the multiple layers. I love this sweet flirty little deer from Hero Arts (H5457), I know it has antlers and so should be a he...but look at those eyelashes... My middle layer is a piece of some scrumptious printed vellum from Stampin up. My deer is stamped on Fog cardstock from Simon Says, and I've colored it with some pencils. I had to add a gem for the nose...because..well Rudolph...and the tag needed a pop of color. The sentiment comes from CTMH- Short and Sweet Sentiments. The tag die is from Pretty Pink Posh, and I hand cut the slit for the ribbon. I admit this will likely end up on the front of a card base before the season is over. We were not a family that ever tagged packages for the holidays. Too much shaking and squeezing...I am an only child so of course there were just the three of us. My Mother used two wrapping papers and one was for my Dad, and one for me. My Dad used two different ribbon colors. I used small stacks...sometimes the cat would create a surprise for us all, by moving one of my stacked gifts...but that made for funny moments. Hi there! I've been getting quite a few cards made for Christmas. I need about 90 of them and I hope to have them finished by the end of November. At last count I had about 45...so half way done. 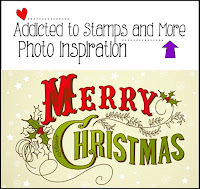 Today's card is inspired by the photo inspiration over at Addicted To Stamps and More. The photo is displayed below. I was inspired by the curlicues and the colors. I found a stamp with curlicues in my stash from Stampin Up. For color I added some copic colored poinsettia's from Ellen Hutson, and a few drops of gold color shine from Heidi Swapp. Tracey McNeely is our muse this week. I loved the off set embossing over a watercolor look on her card. Instead of an outline stamp, I decided to go with a texty stamp over a tree shaped brusho colored area. I love that the brushos gave me both a yellow and green shade in the same container. The stamp comes from Penny Black, Season's Wishes. I die cut one side with SSS's scallop stitches die and added a strip of gold foil tape from CTMH to the opening side. This is a smaller card 3.25 by 5. I love Tracey's technique and design, and I can see using it more often. A quick post today, lots on the to do and lets finish lists! 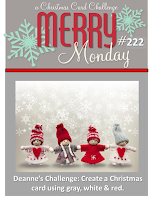 Merry Monday's challenge is to create a Christmas card using gray, white and red. I am really loving the simplicity of this Stampin Up stamp ( Star of Light) embossed with a sentiment. It makes for a perfectly CAS card, with that in mind - I am entering them at ATSM's - Clean and Simple challenge. I set the timer on my phone 90 minutes to create, photograph and upload the card to the Hero Arts Flickr group. The theme is a holiday card which must have a tree on it. 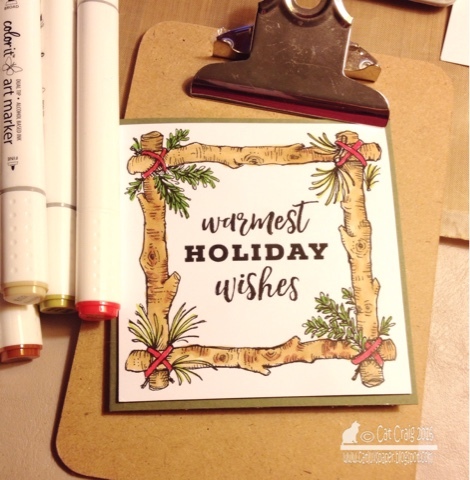 I grabbed my go to Hero Arts Happy Holiday Trees stamp and a second stamp set Greetings for the Holiday also from Hero Arts. I thought the trees might look stunning in Simon's blue violet ink and mounted on the same shade of cardstock. The image was die cut with Simon's postage edge dies. A bit of white satin ribbon and this card is done in less than an hour. 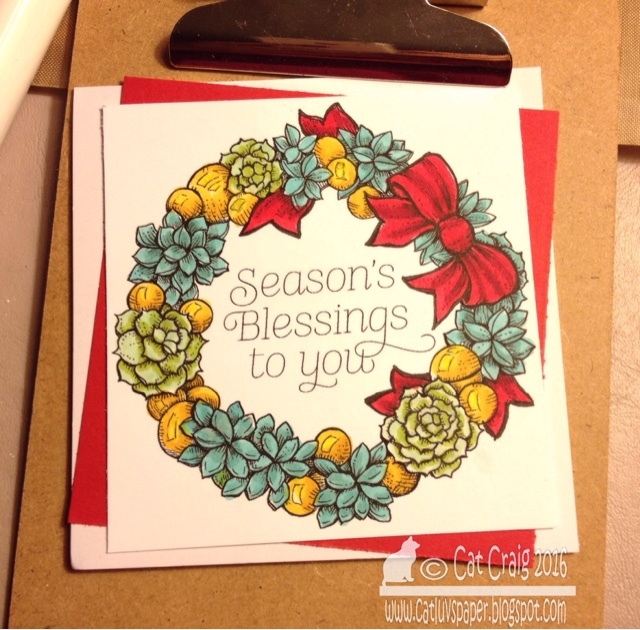 I am also entering this to Hero Arts Holiday Cardmaking Challenge which closes 11-15-16. Hi there, it feels so good to be back in my grove making cards after a summer of waning mojo. This card is for Muse 191. 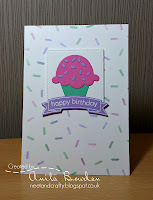 I was inspired by Anita's use of the sprinkles paper backdrop for her sweet cupcake and birthday greeting. I used some multi-hued dotted SU paper and the Happy Birthday circle die from SSS. It made for a very quick card. It has been a while since I was able to organize myself to get a card ready for Merry Monday. The week seems to fly by and I miss my posting deadline before I even begin the card. This week the theme is winter activity. I combined two stamp sets, SU's Christmas Cuties, and CTMH's Hello Winter Holiday. The images and foreground were copic colored, and the sky is inked with distress ink in weathered wood.